I had the great opportunity to attend the 2015 Virginia Counseling Association Conference at the beautiful Homestead in Hot Springs, VA. I attended presentations about mindfulness and yoga, attachment and trauma, international students and counseling efforts, emergency custody procedures, starting a private practice, moral injury in veterans and many more. While I am passionate about learning all that I can about trauma and PTSD, the concept of “post traumatic growth” was new to me and was explored in a few breakout sessions. It was wonderful meeting professionals in the field from all over the state. I enjoyed learning about various counseling settings and received advice from experienced professional counselors. It was fun to connect with Longwood professors, alumni, and classmates outside of the classroom as well! 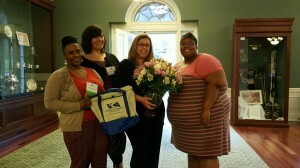 Thank you, Longwood University! This entry was posted by kennelar on November 20, 2015 at 4:36 pm, and is filed under 2015-2016, Counselor Education. Follow any responses to this post through RSS 2.0. Both comments and pings are currently closed.